A characteristic of the Maltese Islands is the pealing of bells. These are heard in old parts of towns and villages especially when one is passing by a major church. The visitor may wonder at the different peals and frequency of ringing. 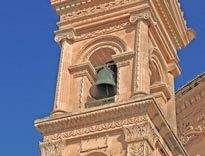 The best two localities, famous for ringing bells, are Ħal Qormi (St George’s) and Birkirkara (St Helen’s). Their bells have kept the traditional rule of informing the faithful of events occurring in the locality. The bells start the day very early. At around 4.30 am the ‘Pater Noster’ is rung with 33 strokes. 33 stands for the number of years Our Lord spent on earth. The other three main ringing times are at 8.00 am, midday and sunset. Many people associated these ringing times with a prayer called ‘Angelus’. The day ends with the ringing of the last bells an hour after the evening ‘Angelus’. This is referred to as ‘De Profundis’. In some localities, their bells ring again another hour after ‘De Profundis’ to remind the faithful that the first hour of the night had already passed. The celebration of Mass has its particular pealing. Mass is announced by a few strokes of a bell fifteen minutes before it starts. This gives enough time for the faithful to leave home and gather in church. Another particular pealing occurs when a church is elevated to the dignity of a Collegiate. In this case the bells ring a two-toned peal for fifteen minutes to inform everyone that the members of the church’s Chapter will gather for matins and vespers. In former days, the church bells used to peal to announce that someone in the parish was dying. This started by nine strokes which were followed by three strokes every hour until the passing bell was rung. The passing bell was followed by the death bell. These last two types of bells are still very common in old towns and villages. There was also a special bell peal called ‘Gloria’ when an infant died. Feast days and sermons had their special pealing. On a festive season, before High Mass and vespers of the titular feast the church bells ring in four periods. When the feast is of secondary importance, the bells ring in three periods of ringing. When there is a special sermon the church bells ring a few minutes before it starts.